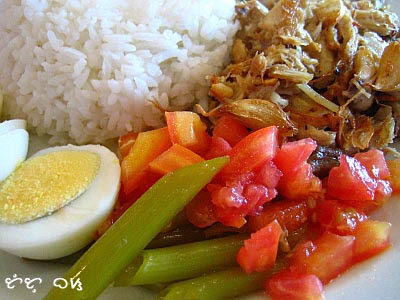 Imagine a hardboiled egg, pickled kangkong (water spinach), fresh tomatoes, steamed rice and shredded adobo flakes with lots of garlic: Adobo Sulipan at Pancake House, Tutubi's favorite adobo recipe incarnation. Now costing around P190, quite pricey for the average pinoy meal, adobo sulipan is worth it although at times the preparation may be inconsistent. Adobo, the Philippines' "national dish," according to some has far too many versions to be listed but the most popular ones, besides adobo sulipan, are adobo sa gata (coconut milk), adobong matamis (sweet adobo), adobong tuyo (dry), adobong masabaw (soupy), adobo sa pinya (pineapples), and adobo sa kalamansi (philippine lemon). About the history behind adobo, Tutubi is planning to post about it in the future along with his own adobo recipe. Even the origin behind adobo sulipan, whether it's related to barangay Sulipan in Apalit,Pampanga as part of the famous "sulipan cuisine," needs further research. Pancake House, not only serves pancakes, but other Filipino specialties, and present in various locations around the Philippines. Wow! Ang sarap! I haven't eaten adobong kangkong in a long time. They have it Chow King. I think I'm going to have some later. Yummy! 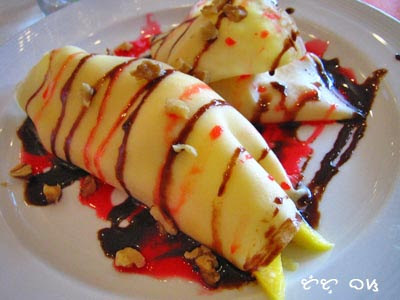 That mango crepe looks wicked. I swear I'm getting hungry too because I haven't had my dinner!